Pakistan says information on possible planned attacks in the US came from a computer seized after the arrest of a key al-Qaeda suspect last week. Proposals were said to be found in e-mails on the computer of Ahmed Khalfan Ghailani, captured after a gun battle. The US has increased tough security measures in three cities with financial institutions mentioned as likely targets for attack. US officials said the intelligence used involved "extraordinary detail". Pakistan's Information Minister Sheikh Rashid Ahmed did not give the specific details of the computer files and other materials seized from Mr Ghailani and other suspected al-Qaeda operatives. But he said there was substantial information about possible attacks on buildings in the US and UK. He said all the documentary evidence, along with information collected from other sources, was passed on to the relevant countries. 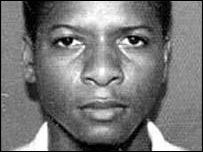 Tanzanian-born Mr Ghailani, wanted in connection with the 1998 US embassy bombings in East Africa, was arrested on 25 July in central Pakistan. The BBC's Zaffar Abbas, in Islamabad, says it appears that US investigators were able to unscramble information on the computers after Pakistan passed on suspicious encrypted documents. Pakistan has also confirmed the arrest of another man believed to be an al-Qaeda computer and communications expert, but it is not clear if this is also linked to the alleged US plot. The security alert has been raised to orange - the second-highest level - in parts of Washington DC and New York. But workers were urged to go about their business as normal despite an increased police presence. Click here for more detailed view of the buildings under threat. New York police closed several streets in Manhattan and banned trucks from bridges and tunnels leading to the heart of the financial sector in Wall Street. Helicopter patrols backed up the increased police presence on the ground. Mayor Michael Bloomberg - flanked by Governor George Pataki and Senator Charles Schumer - rang the opening bell at the stock exchange in a show of confidence in the city's precautions. 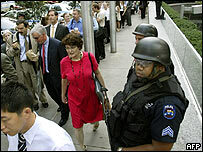 In Washington, police stepped up identity checks as employees filed into the World Bank headquarters. Guards at the International Monetary Fund checked the underside of cars as they entered the garage. The BBC's Barnie Choudhury, outside the World Bank, says some workers said they had been scared by the alert, but others were more accepting of the situation. Treasury Secretary John Snow, said the US' financial system was running smoothly. "While we must always remain vigilant against terror, we will not be intimidated and prevented from enjoying our lives and exercising our freedoms," he said. Homeland Security Secretary Tom Ridge said there was no indication when attacks might be attempted but warned they could come at any time in the next three months, before November's presidential poll. He said buildings specified in the intelligence included International Monetary Fund and World Bank buildings in Washington; the New York Stock Exchange; Citigroup CN buildings in New York, and the Prudential building in Newark, New Jersey. "This is not the usual chatter. This is multiple sources that involve extraordinary detail," he added. Mayor Bloomberg urged New Yorkers to continue to go about their business. The city has already been planning a massive security operation to protect the Republican National Convention in late August, when the party will nominate President George W Bush as its candidate for the November election. "Let me assure all New Yorkers of one thing: we are deploying our full array of counter-terrorism resources," Mr Bloomberg said. New York was the US city that suffered most casualties on 11 September 2001, with almost 2,800 people killed. "Once again New York was a city having to live with fear"